How much do you know about mangoes? Have you ever tasted one? Do you know about the multitude of nutritional benefits the mango can provide? Let’s take a closer look at this extraordinary fruit. We’ll discuss what a mango looks and tastes like, what type of fruit it is, and how mangoes can improve overall health and wellbeing. Mangoes are a juicy stone fruit, meaning the flesh of the fruit surrounds a stone or pit in the center. Generally, mangoes are round, oval, or kidney-shaped. Their smooth, waxy outer skin varies in color and is typically a combination of yellows, greens, oranges, and reds. The smallest mangoes are plum-sized while larger varieties can weigh four to five pounds. The mango is native to South Asia and other tropical regions. 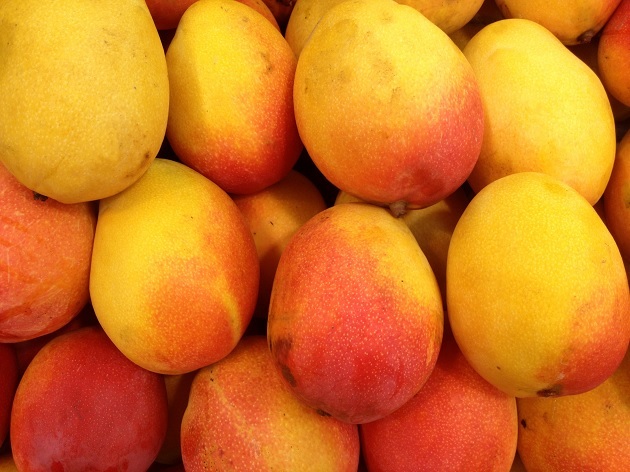 Most mangoes that are imported into the United States come from Mexico, Peru, Ecuador, Brazil, Guatemala, and Haiti. Within the US, a small number can be successfully grown in California and Florida. Think back to eighth-grade biology and the scientific classification system. Mangoes are in the Sapindales order, which means they are a flowering plant or shrub. Surprisingly, mangoes belong to the Anacardiaceae family, which includes cashews, poison ivy, and poison sumac. This explains why some people experience an adverse reaction after handling mango skins, leaves, and stems. A ripe mango tastes juicy and sweet with a hint of spice. Some people compare the mango with a peace or pineapple. 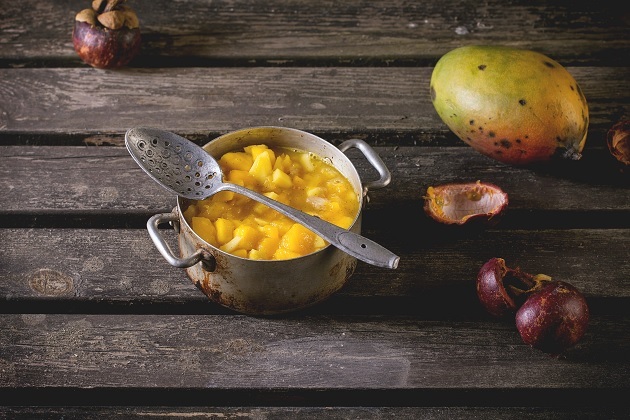 Occasionally, mangoes have a turpentine or piney taste and a stringy, fibrous texture. This has to do with the ripeness of the fruit, as well as its growing conditions. 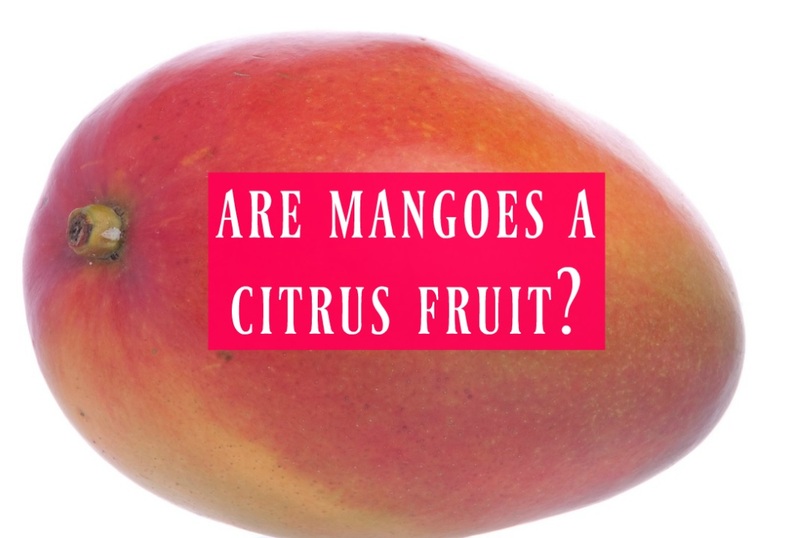 Are mangoes a citrus fruit or a tropical fruit? Is there a difference? Let’s briefly discuss citrus fruits. They are native to tropical and subtropical regions. Scientifically, they are Sapindales, but they belong to the Rutaceae family. Their inner pulp is perfectly divided into several segments. This pulp contains large amounts of citric acid which can make the fruit taste sweet or sour. Mangoes are not a citrus fruit. Tropical and subtropical fruits are those that have their origin in tropical and subtropical areas. (1) They are an evergreen tree or shrub. True tropical fruits cannot tolerate cool temperatures and frost, while some subtropical fruits (like oranges) can withstand occasional brief dips in temperature. Mangoes provide a wide range of vitamins, minerals, and antioxidants. Looking at the recommended daily allowances for vitamins and minerals, one serving provides 100% of recommended vitamin C, 35% of vitamin A requirements, and 12% of total fiber intake. mangoes contain no fat, cholesterol, or sodium. In many tropical areas, especially those with limited resources, the mango is used for so much more than eating. The pulp, seeds, and skin, as well as the leaves and bark of the mango tree, all have medicinal purposes. Asthma, wounds, diarrhea, heat stroke, indigestion, and several other maladies are treated with various parts of the mango or mango tree. They are also thought to possess antibiotic, anti-fungal, anti-viral, and anti-parasitic properties, just to name a few. Mangoes contain powerful antioxidants which may help prevent colon, breast, leukemia, and prostate cancers. Other benefits of the mango include improved memory and concentration and lower cholesterol levels. Sliced mangoes can even be placed on the skin to help unclog pores and treat acne breakouts. It also improved healthy bacteria in the gut. More research is needed due to the small scale of the study, but results were very positive. Researchers found that mango consumption promoted favorable changes in blood pressure as well as gut fermentation. Although larger studies are needed, this study suggests mangoes could be a “heart-healthy” fruit. To choose a ripe mango, squeeze the fruit gently; a ripe mango will give slightly. Also, the stem area should be fragrant. Because of the inner stone, cutting a mango can be challenging at first. Browse online videos for cutting tips. They provide several healthy vitamins, minerals, and antioxidants. They are also extremely beneficial for their medicinal properties, especially in areas with limited resources and poor access to medical care. Although both mangoes and citrus fruits are considered tropical fruits, the mango is not a citrus fruit. If you are looking for a delicious fruit with loads of nutritional value, choose a mango!